To Edit a card’s details, tap the name itself. On the iPhone, this will take you straight to the Edit screen. 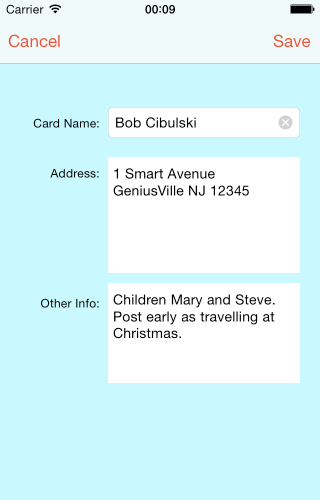 On the iPad, this will show the card details on the right-hand pane. To Edit the card, tap the Edit button on the top left. If the name tapped is one that was entered for local use (i.e. not from Contacts), you will be presented with a screen such as the one shown below. 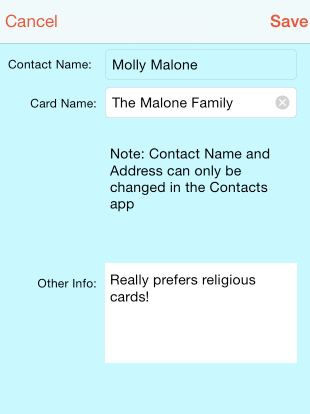 Tap into either of the 3 fields – Card Name, Address or Other Info, and make the changes as required. Then tap the Save button. If the name is one that was initially imported from your Contacts, the situation is slightly different. The screen presented will be similar to the one below. The Card Name and Other Info can be changed as before. 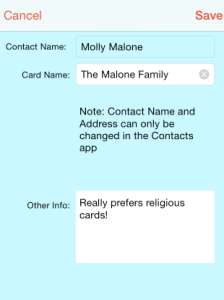 However, if the name or address have to be changed, this should be done within the Contacts app. Remember – the Contact Name is the name as it appears in Contacts. 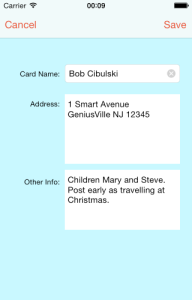 The Card Name is the name that will appear on the Card List and on address labels etc.